Blake Crouch isn’t kidding with his title. Imagine if the entire United States descended into a state of emergency, where seemingly ordinary people are murdering their neighbors, police are opening fire on the elderly at nursing homes and all you can hear at night is the sound of gunfire and screaming. Madness has overcome the public, and now they’re reading names off on the radio…names of people that need to be killed. While you’re listening, you hear them read your name and address. What can you do, but RUN! Like the big rides at Six Flags…you might want to sit this one out if you have a heart condition. Check out the Book Club Link to the right. I loved loved loved Run. I’d highly recommend it to anyone who is a fan of Swan Song or The Stand. Shoot! It’s 11 PM and I’m only halfway through Run. Reading this reminds me of the first time I saw the movie, The Fugitive. I feel like I can’t catch my breath; something is always happening, practically mowing me down with its energy. Nancy, I’ll be surprised if you managed to get any sleep last night. Even if you put the book down, you’d need a sedative to knock you out. The book keeps you on edge…and I don’t want to spoil it for you, so I’ll shut up here. Come on back when you’re done. I’d love to hear what you think about the rest of the book. I loved it! The ending was really well done. Of course, I had to read several more of his books after that. Yeah, the ending was pretty amazing. What other books by Blake did you read? I hate to admit that I haven’t read any more of his books. I asked Blake to recommend a starting place for his other works, and he suggested I read the Andrew Z trilogy. It looks awesome. Have you read any of this trilogy? Yep, all three books. Also kept me awake late at night, to the bitter end. There really needs to be another one that makes everything all better! I like the sound of that. Sometimes, I don’t want to read a book that makes everything all better. The last thing I need to do right now is add another book or books to my reading list, but here it goes. Thanks, Nancy…and I didn’t mean that sarcastically. Sorry, Steve…I need to read your book now. 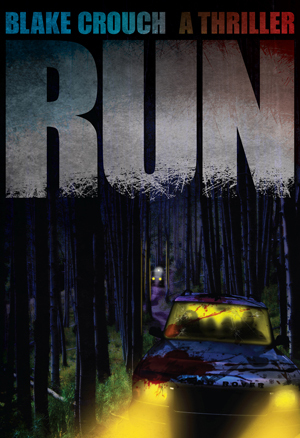 RUN is without doubt the best Blake Crouch book I’ve read. Its fundamentally classic horror / apocalypse theme resonate beautifully throughout this magnificent tale. Renee, thanks for the series of comments. Very sorry to take so long to respond…been in my writing cave. RUN is fantastic. It might be a little too much for some readers in terms of violence (chainsaw mass grave scene…never forget that one. Saw one of those chain saw on a pole things at the hardware store and shook my head), but it’s a classic “what if” scenario.